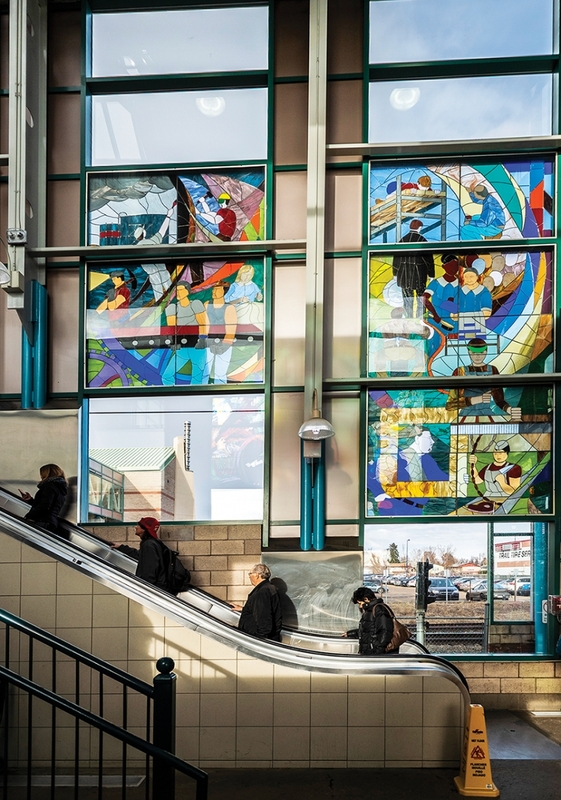 If you find yourself at this LRT station, take a few minutes to admire the gorgeous stained glass panels. Ever since Rogers Place supplanted Rexall Place as Edmonton’s big event venue, the Great One’s old stomping grounds have become comparatively vacant. The area along the northeast LRT line is under development and growing, but, for now, there isn’t much to look at. That is, unless you get off one stop short of Clareview, where you’ll see the city’s most aesthetically pleasing train station: Belvedere. The result is a series of stained glass panels depicting people hammering, painting and framing; a seamstress, cooking and cleaning staff; workers on scaffolding and a pair carrying steel beams who could have constructed the station itself. Like a lone garden flower waiting for its surrounding seedlings to sprout, the enclosed, cathedral-like terminal now stands as a testament both to Fort Road’s blue-collar past and the immediate area’s current condition. It’s a workman’s church, in an area filled daily with parishioners, brightened most beautifully by clerestory windows shining in light from all sides. Titled “Travail in Tandem” – travail being a French word meaning work, especially of a painful or laborious nature – the two-sided display is a vibrant vestibule that connects the past with the present, ensconces commuters in colour and reminds workers building up the Fort Road area that they’ll never be alone so long as there’s a job to be done.